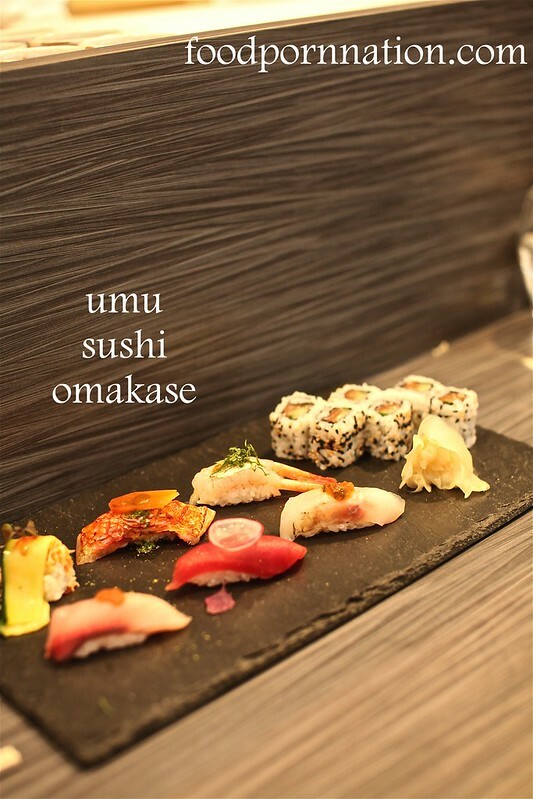 Regularly frequented by the staff of the Japanese Consulate, Umu (one michelin) is normally situated in the heart of Mayfair. However, on this occasion we find Umu located inside Frieze Masters, a fine art exhibition in Regents Park, London. 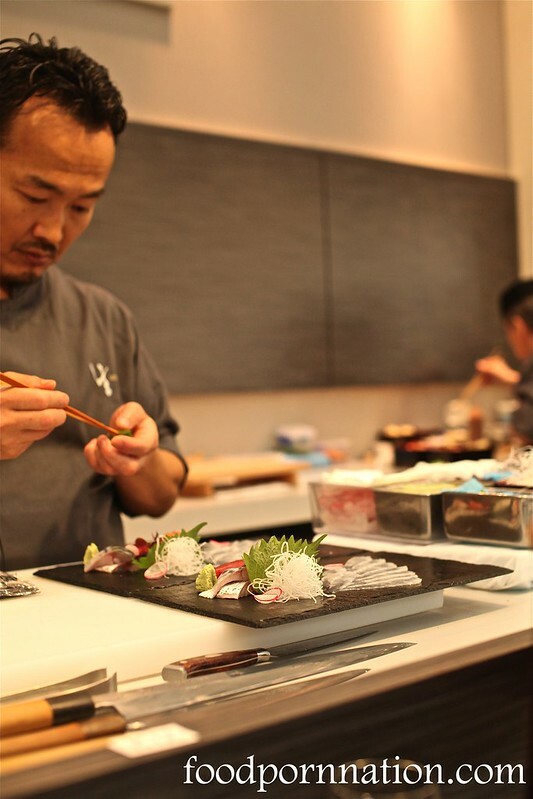 For four days only the Umu became a pop up restaurant featuring a limited selection of of sashimi, sushi, mains and desserts off their original menu. Nonetheless, this is sufficient to showcase the exquisite craftsmanship of Head Chef Yoshinori Ishii, who with his nine years experience at Japan’s three Michelin-starred Kyoto Kitcho, delivers a menu that is gracious, delicate and visually dazzling. 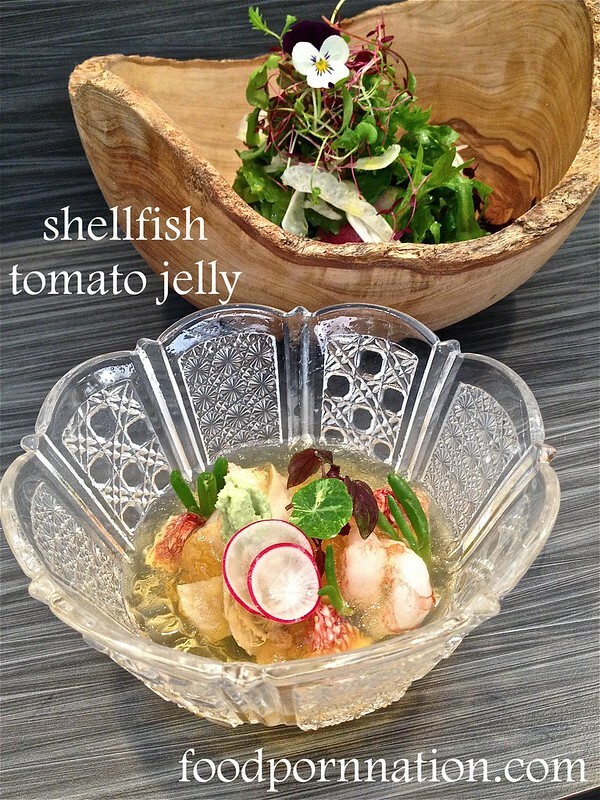 The shellfish tomato jelly (£16) is a jewelled masterpiece marked with a constellation of abalone, scallop and shrimp gems nestled cooly in a wobbly translucent jelly. Served cold, the dish is playfully subtle and texturally contrasting. The meat is supple while the veg holds the crunch. All going down very nicely with the slip of the jelly. The green salad (£9) is a pretty little thing. While small in portion it remains a lovely addition and is perfectly dressed. Tuna tartare (£15) is generously portioned and is simply outstanding. The lotus discs give it a wonderful contrast and texture to the luxuriant pieces of tuna, pairing deliciously with the umami and sweetness of the shiso dressing. I make like a cracker and spread the tartare all over my lotus discs. I’m reminded of the sashimi tacos at Sake and the salmon tartare at Sushi e back in Sydney, with its gorgeous textures. At this point, I am blown away at the presentation and quality of the sushi before me. As you can see, the knifeman-ship is spectacular. Take a closer look and you will notice the translucent radish cups and sashimi feathers fanning majestically across the table. 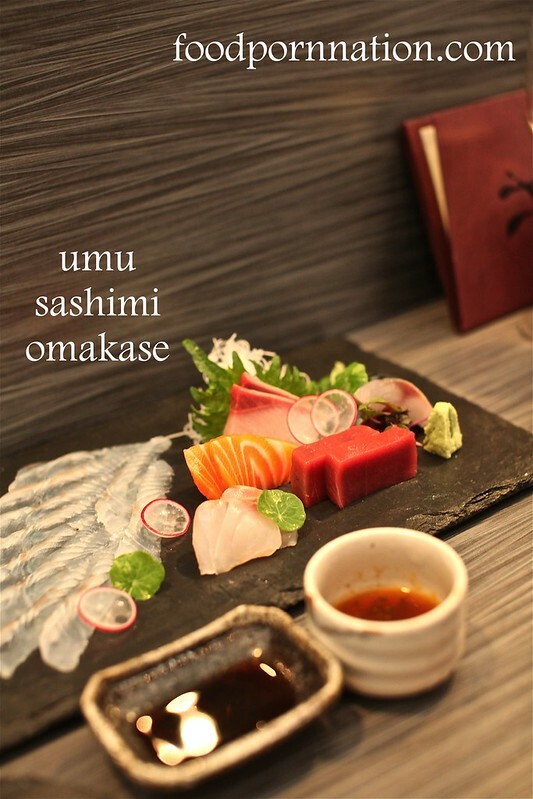 The Umu sashimi omakase (£32) included mackerel, yellowtail, tuna, sea bream, salmon, and brill. The Umu sushi omakase set (£32) was served as a three piece classic nigiri (yellow tail, tuna & sea bream) and three ‘Umu’ original nigiri piece (crab, brown mullet & shrimp). The best bit? That piece of shrimp. This was topped with a tosazu mayonnaise, caviar and a touch of truffle that was simply mesmerising. The wagyu beef (£32) arrives gleaming with its pink centre. To me, “the pinker, the better”. Lightly seared, its deliciously fatty and melt in your mouth. 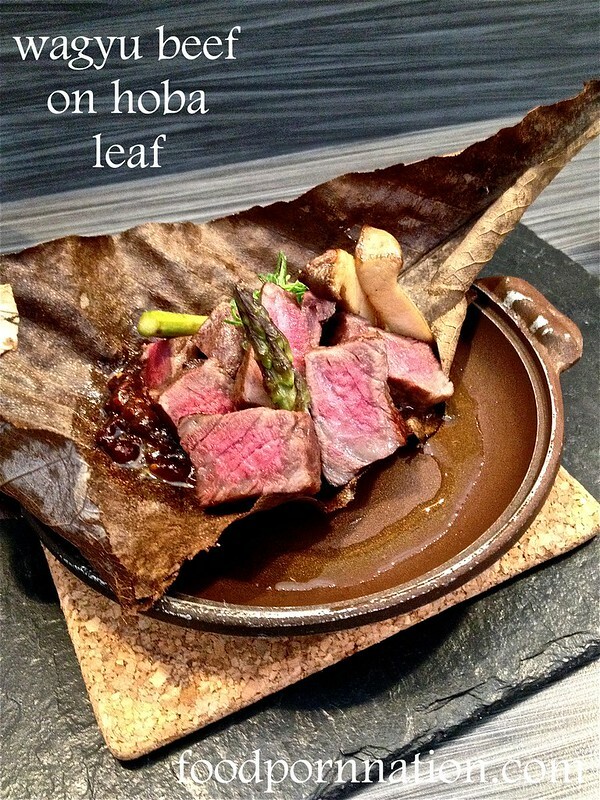 The beef is served on top of a red miso, sesame & nut sauce wrapped inside a hoba leaf, imparting earthy tea leaf notes into the flesh, similar to that of sticky rice wrapped in lotus leaf. 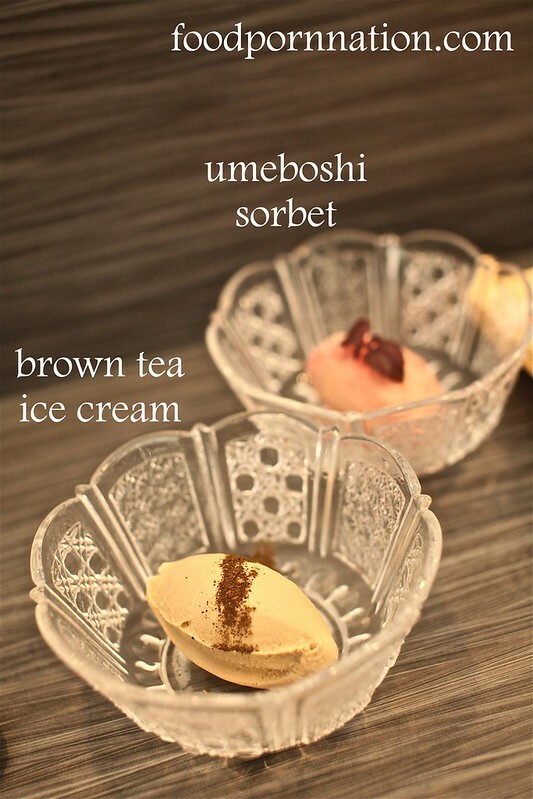 Umeboshi (picked plum) sorbet (£5) was a subtle and refreshing dessert. However it was the brown tea ice cream (£5) that took our breath away, that we even ordered another round. It was like a smooth, creamy and nutty cup of tea. 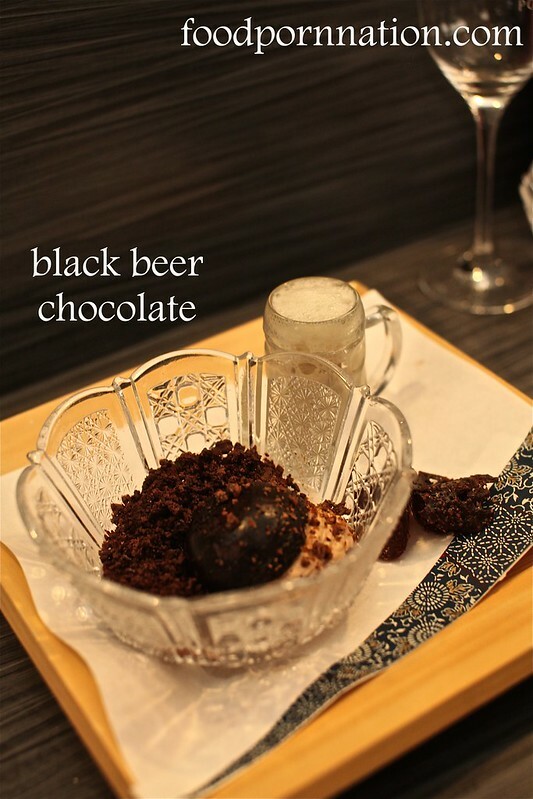 The BBC, as referred to by Umu ( black beer chocolate – £12) invited you to pour the beer foam over the scrambled chocolate, chocolate cake and the beige beer chocolate cream. Surprisingly this was a well balanced use of beer with chocolate, working well rather than against each other. 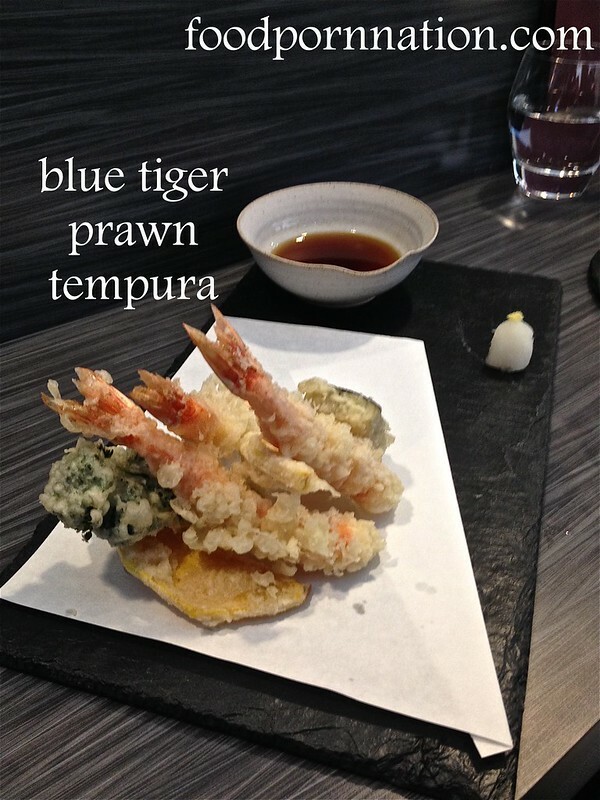 Wow, this is some beautiful looking Japanese food! Everything is so elegantly presented and looks so fresh and delicious-tasting. I am just salivating over the sashimi and sushi. And I love how the BBC comes with that tiny mug of beer foam! I know it was really difficult to eat something so pretty!! 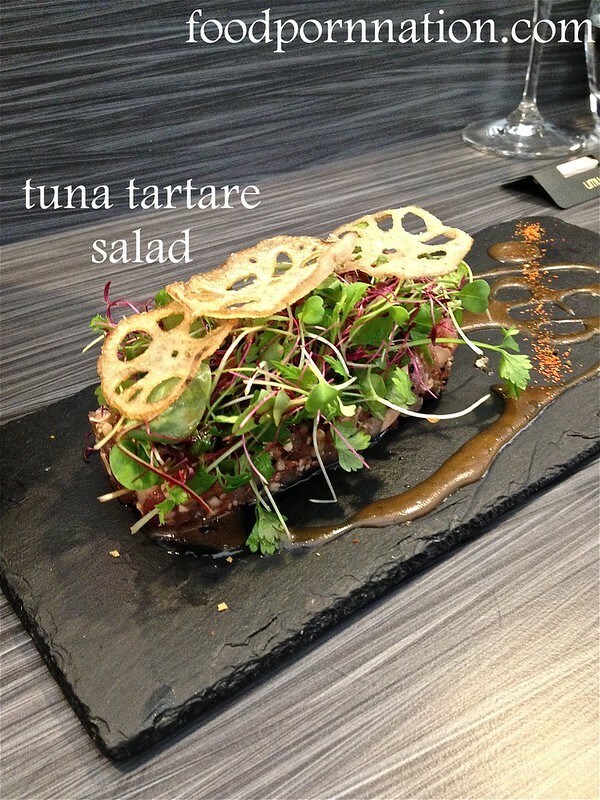 i have my eyes on the tuna tartare salad! oooo my eyes keep darting towards the sashimi! It was soooo pretty!! Wow such gorgeous plating! Especially loving that wooden bowl holding the salad. It’s so beautiful! I agree everything was done so beautifully! Looks totes amazeballs! Will definitely pay them a visit. Have always been fond of Mayfair and will definitely pay them a visit next time I’m over. Indeed! 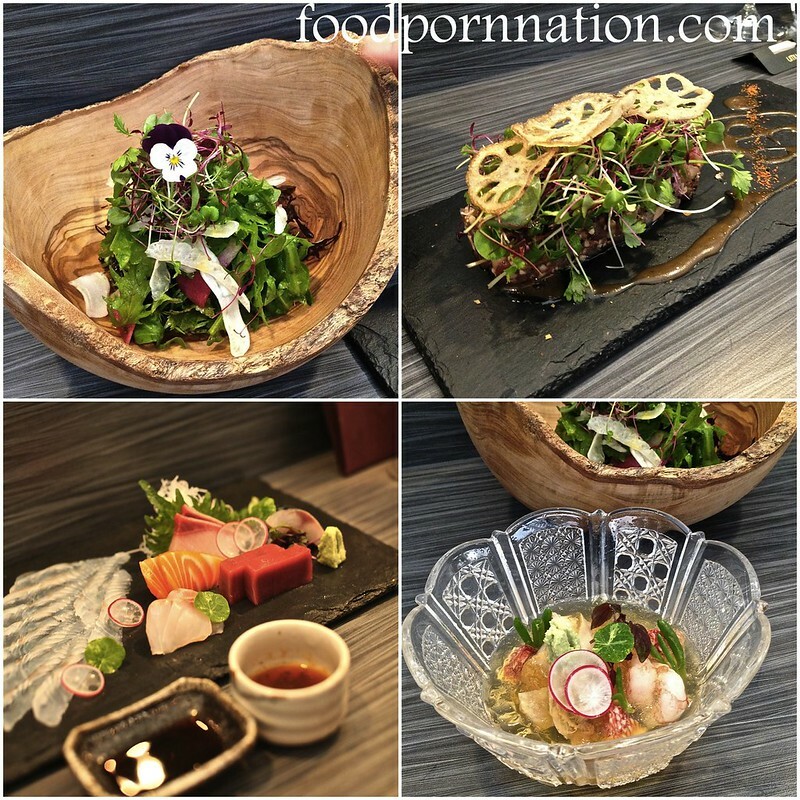 I especially loved the plating of the sashimi on the bottom left corner of the first image. So ironic but cutely at the same time – couldn’t help but chuckle! Totes amazeballs blog! Well done! Everything is just so pretty! 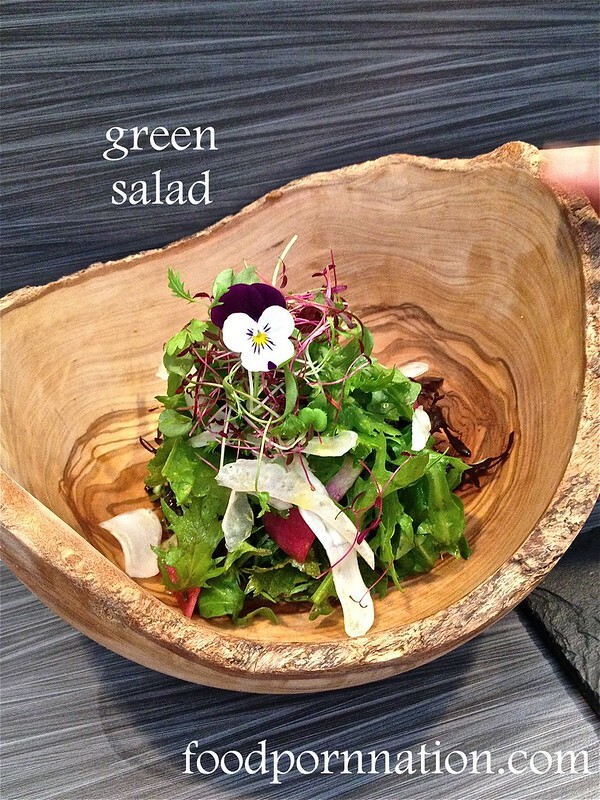 Love, love, love that green salad presentation – so gorgeous!